maybe you associate upside down cakes with the 1950s/1960s and canned pineapple/maraschino cherries and jello salad and packaged everything and being old. i don’t. when you flip one out, it’s like the christmas morning of cakes, a surprise hidden under fluffy, fine-crumbed cake even if you’re the one who made the cake and know exactly what’s happening. convinced? great. no? well, this caramel banana upside down cake is buttery cake with a butterscotchy topping. still not sure? you can go hang out with my brother and have toasted chicken nuggets blanketed with cheddar cheese, washed down with handfuls of tortilla chips and maybe an apple if someone else has already cut it up. come along, everyone else. i love how caramelly the top of the cake gets. the banana isn’t very pronounced, but that could be a good thing depending on how much you like/don’t like bananas. chances are that you’re into them, though, if you’re making this (otherwise are you a masochist? or maybe more sensibly, it’s for someone else and you’re not eating it, or you have a bunch of dying bananas, etc etc). and if you’re really into bananas, why not do an upside down banana banana bread? oh goodness, i want. that. now. anyways, back to this cake- the topping is obviously the star. 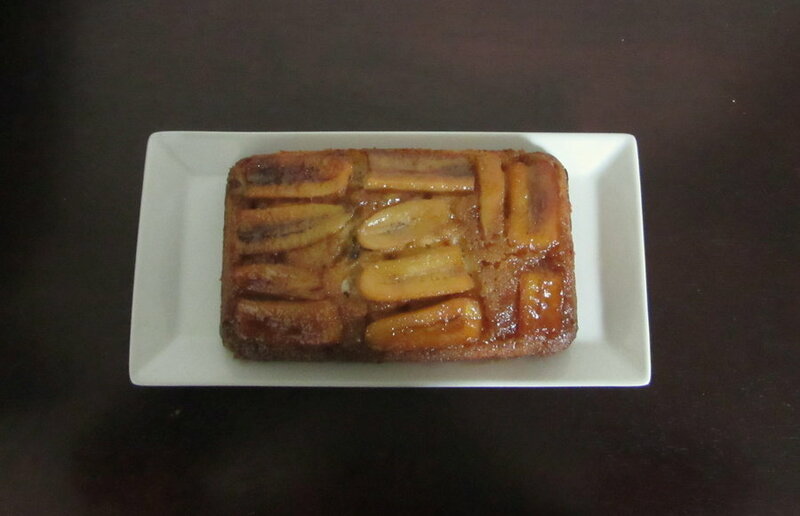 the cake is moist and tender and quite a good cake, but the syrup soaking into the rest of the caramel banana upside down cake and the tender bananas that could quite possibly be poor man’s edible gold steal the show. Melt butter in a saucepan over medium heat. Once it starts to bubble, add sugar and let simmer for 3 minutes until thick and smooth. Alternatively, melt the butter and sugar in a heatproof bowl in the microwave until the sugar is dissolved and butter is bubbly. It won’t become homogeneous no matter how much you stir, but that’s okay; it’ll smooth out in the oven. Pour into greased 9×5” loaf pan. Cut bananas in half lengthwise and cut each half into 2 or 3 pieces widthwise. Place over caramel, cut side down; you can place them very close together, since the bananas will shrink in the oven. In a medium bowl, sift the dry ingredients (or don’t, let’s be rebels). Beat the butter and sugar until light and fluffy. Add eggs one at a time, beating well after each addition. Beat in vanilla. Beat in the flour mixture in 3 additions, alternating with the sour cream. Place dollops over the bananas (it’s easier than trying to pour it because it’s fairly thick) and smooth the top. Place in the oven, and set a baking sheet on the rack beneath the cake to catch any caramel drips. Bake at 350F for 40 – 50 (mine took 54) minutes or until golden and a skewer comes out clean. Cool for 5 minutes in the pan, then invert onto a wire rack. Serve warm or at room temperature. I secretly love upside down cakes so, so much. (Welp, guess it's a secret no more…if it's on the internet…) I mean, the caramelly goodness! How can you not? I have never made an upside down cake at all. This one looks like a great one to start with. Looks pretty good to me! Going to try it soon!